Using a bird feeder pole to hang your bird feeder is a great option because you can control exactly where your feeder is placed. 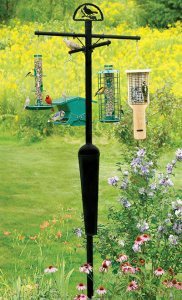 There are poles that you simply insert into the ground, feeder pole systems that come in sections with removable sleeves to make mowing around the pole easier and bird feeder poles for decks. There are even squirrel-proof bird feeder poles if that is an issue for you. When deciding upon which bird feeder pole to purchase, look for poles that are durable and have a weather or rust resistant finish. One of the biggest complaints with bird feeder poles is that they are not strong enough to hold a bird feeder completely filled with seed and start to droop or bend over time. If you can, buy a pole that is made from steel construction or an equivalent strong material. This is especially important if you plan to hang a larger bird feeder and/or in addition to the bird feeder on a pole with multiple hangers, adding the weight of flower baskets or more bird feeders. Here are some well reviewed bird feeder poles sold at Amazon. 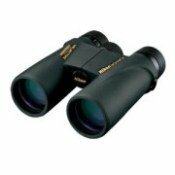 You can read all the reviews by clicking on the links or photos of the items listed below. Should you get a feeder pole with multiple hooks for hanging flower pots or more than one bird feeder? It's up to you. Hanging flowers next to a hummingbird feeder on the pole will be an added bonus to attracting more hummingbirds to your feeder for sure. Or you can hang one thistle feeder to attract finches and another type of feeder - hummingbird, oriole feeder or hopper feeder with a wild bird seed mix, for example, to attract other species of birds. Then your pole mounted bird feeders would act as a larger bird feeding station. Hanging your bird feeder from a pole is especially a good option when squirrels are a problem. Climbing a pole presents one more level of difficulty for those crafty little mammals and a squirrel baffle is a definite must to ultimately have a squirrel proof bird feeder pole. Also keep in mind when installing your pole that squirrels can jump far distances. So do not install your pole next to a tree or deck or other structure where squirrels can launch from to avoid climbing the pole and baffle altogether. 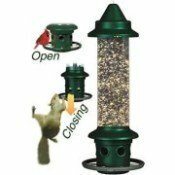 Squirrel Proof Bird Feeder Pole - Specially made squirrel-proof pole and floating baffle system to prevent squirrels from reaching your bird feeders. And for even more protection, check out our Squirrel Proof Bird Feeder Comparison Chart. 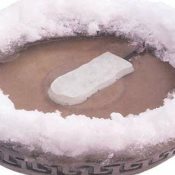 Review of Squirrel Buster, Droll Yankee Flipper, Homestead Stop-A-Squirrel and more.